Dysferlin protein plays a key role in the multimolecular complex responsible for the maintenance of sarcolemma integrity and skeletal muscle cell functioning. We studied the membrane distribution of nicotinic acetylcholine receptors and α2 isoform of Na,K-ATPase in motor endplates of m. soleus in dysferlin-deficient Bla/J mice (a dysferlinopathy model). 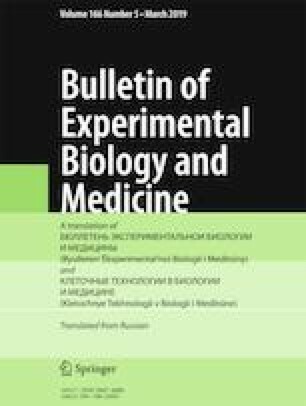 Endplates of Bla/J mice were characterized by increased area (without changes in fragmentation degree) and reduced density of the membrane distribution of nicotinic acetylcholine receptors in comparison with the corresponding parameters in control С57Bl/6 mice. The density of the membrane distribution of α2 isoform of Na,K-ATPase was also reduced, but the level of the corresponding mRNA remained unchanged. It can be hypothesized that abnormal membrane localization of α2 isoform of Na,K-ATPase results from adaptive skeletal muscle remodeling under conditions of chronic motor dysfunction. Matchkov VV, Krivoi II. Specialized Functional Diversity and Interactions of the Na,K-ATPase. Front. Physiol. 2016;7. ID 179. doi: https://doi.org/10.3389/fphys.2016.00179. Nagy N, Nonneman RJ, Llanga T, Dial CF, Riddick NV, Hampton T, Moy SS, Lehtimäki KK, Ahtoniemi T, Puoliväli J, Windish H, Albrecht D, Richard I, Hirsch ML. Hip region muscular dystrophy and emergence of motor deficits in dysferlin-deficient Bla/J mice. Physiol. Rep. 2017;5(6). pii: e13173. doi: https://doi.org/10.14814/phy2.13173. Perry BD, Levinger P, Morris HG, Petersen AC, Garnham AP, Levinger I, McKenna MJ. The effects of knee injury on skeletal muscle function, Na+, K+-ATPase content, and isoform abundance. Physiol. Rep. 2015;3(2. pii: e12294. doi: https://doi.org/10.14814/phy2.12294.